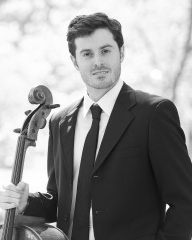 Cellist John Patrick Popham was born and raised in Louisville, Kentucky, where he began his musical instruction under the tutelage of Wayne Krigger, Louise Harris, and Susannah Onwood. John holds a BM from the Manhattan School of Music where he was a student of David Geber, founding cellist of the American String Quartet. He recently completed his MM also at the Manhattan School of Music where he was the recipient of a full scholarship and studied with David Soyer, founding cellist of the Guarneri String Quartet. John has performed as a soloist with the Louisville Orchestra and the Starling Chamber Orchestra on numerous occasions. In the summer of 2000, he and his sister, violinist Emily Popham Gillins, were featured soloists with Louisville Orchestra performing throughout the Midwest. As a chamber musician, John has performed throughout North America, South America, and Europe in such venues as Carnegie Hall, Zankel Hall, The Great Hall of Cooper Union, The Kennedy Center, The Hanns Eisler Hochschule fur Musik, and at Yale, Princeton, and Columbia Universities. John is currently a member of Either/Or Ensemble, the Toomai String Quintet and Red Light New Music. John has served as principal cellist of the 2000 National Festival Orchestra, the Louisville Youth Orchestra, and orchestras at Indiana University School of Music and the Manhattan School of Music. He has participated in various festivals including the Music Academy of the West, the Aspen Music Festival, Spoleto USA, Musicorda, Lucerne Festival Academy, International Ensemble Modern Academy, IMPULS, and the Darmstadt Internationalen Ferienkurs fur Neue Musik. John has appeared at festivals including the Vermont Mozart Festival, USINESONORE (Switzerland), and the Contemporary Classical Music Festival (Peru). An active performer of contemporary music, John has performed with Ensemble Pampelmousse, the Argento Chamber Ensemble, TACTUS Contemporary Ensemble, Talea Ensemble, Grenzenlos, The New Music Collective, and Either/Or. John has worked with such composers as Pierre Boulez, Klaus Lang, Nils Vigeland, Reiko Fueting, Fabien Levy, Tristan Murail, and Steve Reich. John has appeared on KET, WHAS, and WUOL’s “Lunchtime Classics” program. As a member of the Toomai String Quintet, he has recorded for Tzadik Records. John currently resides in Red Hook, Brooklyn. He teaches in the Pre-College Division of Rutgers University.